The photo-sharing platform is doing what Twitter won’t: giving users tools to fight abuse. Where other social networks struggle to give users tools to fight abuse (ahem, Twitter), Instagram is doing its part to make the photo-sharing platform a safer space. How so? By letting you turn off comments altogether. 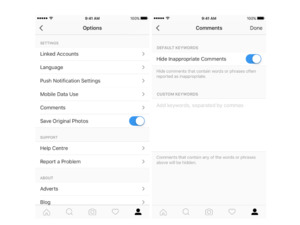 Before Tuesday, Instagram allowed you to filter comments based on specific keywords, but the new feature rolling out soon to everyone will let you turn comments on and off whenever you want. Just tap Advanced Settings at the bottom of a drafted post before you share it and toggle on Turn Off Commenting. You can turn comments back on after a post is live by tapping the ellipses menu. Instagram is also soon turning on likes for individual comments to “encourage positivity throughout the community,” Instagram co-founder and CEO Kevin Systrom wrote in a Tuesday blog post announcing the new tools. A couple of other safety features are also coming soon to make the platform a better place. An anonymous reporting tool is rolling out for users who see self-injury posts. If you submit a report, Instagram’s team will be working around the clock to connect users at risk with organizations that can help. And if you have a private account, Instagram is now letting you remove followers without blocking them. The person you removed won’t be notified of the change, though they might figure it out if you unexpectedly drop out of their feed. Hey, Twitter, are you paying attention? Take some notes.